Bring art into the classroom with 20 engaging projects that connect to social studies topics! Each art project reflects the culture or geography of a different country, such as paper fish kites from Japan and carnival masks from the Caribbean. Includes step-by-step directions and 8 full-color pages showing sample projects. 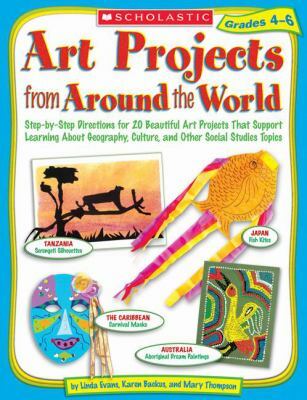 For use with Grades 4-6.Evans, Linda is the author of 'Art Projects from Around the World Grades 4-6' with ISBN 9780439385329 and ISBN 0439385326. Loading marketplace prices 4 copies from $21.39 How does the rental process work?